Students often ask, “What is the difference between meditation and restorative yoga?” This is a great question, because we tend to think of both in terms of the same set of desired results: reduced stress, a quieter mind, an improved sense of well-being. But while both practices can lead to those outcomes, the paths to attaining them are quite different. Meditation consists of concentration (focusing the mind), mindfulness (being present), and contemplation (reflecting on thoughts and feelings). In meditation, we sit upright to align the body’s energy centers and inhibit drowsiness. We bring our awareness to the breath as a means of focusing the mind’s attention. During practice, we can continue concentrating on the breath, or we might repeat a mantra or concentrate on an object. Notice the word “concentrate” – that implies effort! So, while we may look peaceful and serene sitting our cushions, inside, we may be working quite hard to rein in our mental activity. In contrast, the intent of restorative yoga is to enable healing through rest. Reclining postures are fully supported with blankets, bolsters and other props, and we remain in them for 15 to 20 minutes so that the parasympathetic nervous system has sufficient time to return the body to its natural, un-stressed state. In this context, “rest” is somewhere between sleep and wakefulness, and the experience is meant to be totally effortless, comfortable and relaxing. In this class, we begin with a restorative pose, during which students are guided into relaxation. This is followed by a 15-minute seated meditation, after which we take one or two more restorative poses. The reality of all yoga practice is that each time, for each student, the experience and effects will vary. But in general, students have expressed that practicing meditation and restorative in combination allows them to go deeper into both, leaving them feeling more refreshed, relaxed and renewed at the end of class. The Meditate and Restore class is offered on Wednesdays from 11:30am to 12:30pm. 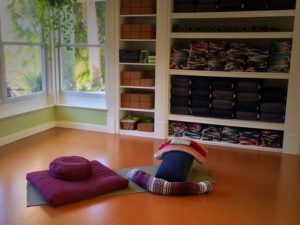 We also offer a one-hour Restorative class on Fridays from 5:30 to 6:30pm.